The 5th Dragoon Guards was stationed at Aldershot, Hampshire when Britain declared war on Germany on 4 August 1914. During the First World War, the 5th Dragoon Guards served on the Western Front from August 1914 as part of the 1st Cavalry Brigade, Cavalry Division which was renamed as the 1st Cavalry Division in September 1914. The 5th Dragoon Guards served with the formation on the Western Front for the duration of the war. The 5th Dragoon Guards returned to Ireland in April 1919 and was stationed at Kildare. If you would like to learn more about the Regiment during the First World War I’d recommend downloading its war diary which I have discussed below. Start by looking through my guides to Researching Soldiers who Served in the British Army. The most important being the articles concerning medals, service records and abbreviations and acronyms (you will come across a lot of jargon). Next, download the war diary for a small fee from the National Archives which I have discussed below. Officers: Hopefully, a service record has survived either at the National Archives (I offer a copying service) or if an officer served past April 1922 at the Ministry of Defence: Ordering a Service Record from the MOD. Have a look through the war diary as officers are frequently mentioned and look at my articles on the London Gazette and Hart’s Army List. If you’re searching for a photograph of an officer then always conduct a newspaper search. 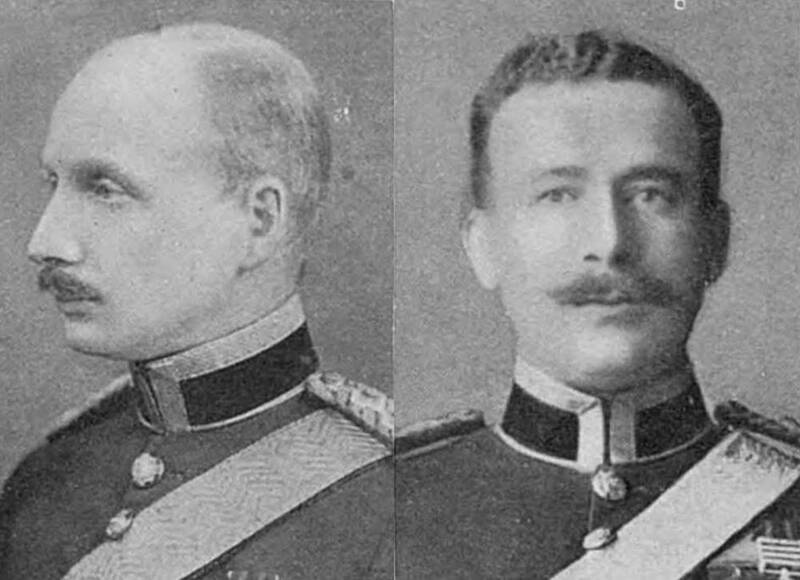 The portraits of Captains John Norwood and Robert Charles Partridge which were published side by side in The Sphere, 3 October 1914. Norwood won the Victoria Cross during the Siege of Ladysmith in the Boer War. The Imperial War Museum has some transcriptions of the letters he wrote in August and September 1914. Both officers were killed in action shortly after landing in France. Other ranks: Have a look for a service record but many were destroyed during the Blitz. If a soldier served past January 1921 then their record will still be with the Ministry of Defence: Ordering a Service Record from the MOD. If no service file has survived then there’s a possibility that only medal records could remain. You should be able to work out an approximate enlistment date from a soldier’s regimental number. 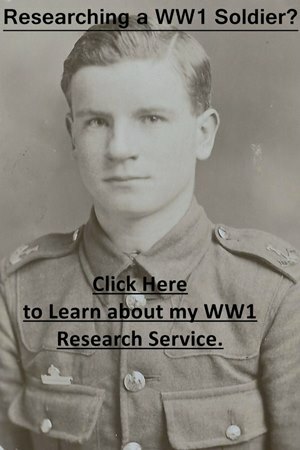 To research soldiers who served in the First World War, you will need to join both FindmyPast and Ancestry as they have different record sets. Fortunately, both have free trials and clicking on the banner below will take you to FindmyPast. British libraries often have free access to both sites. 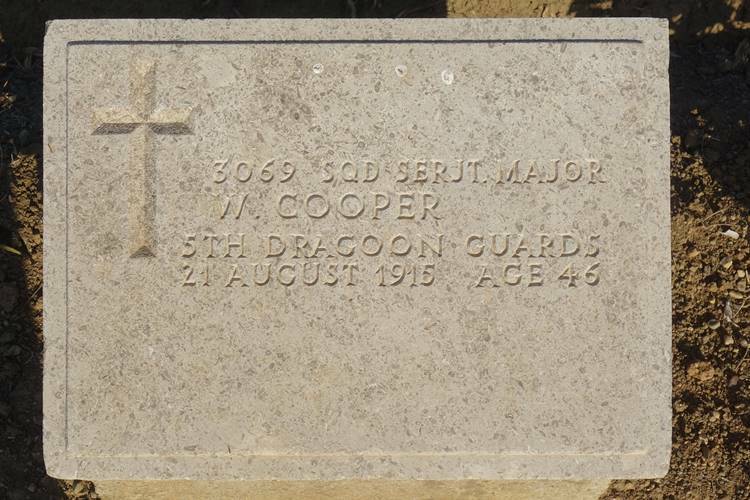 The headstone of Squadron Sergeant Major William Cooper, 5th Dragoon Guards attached Hertfordshire Yeomanry who is buried at the Green Hill Cemetery, Gallipoli, Turkey. Both officers and non-commissioned officers of regular cavalry regiments were often attached to volunteer yeomanry regiments. Cooper had served with the 5th Dragoon Guards in the Second Boer War (1899-1902) and was killed in action during the attack on Scimitar Hill on 21 August 1915. There is only a single war diary for the 5th Dragoon Guards which is very good and has been digitized by the National Archives. You can download the war diary from the National Archives’ website for a small fee by clicking on the hyperlink (blue text) below. Notes: This is a very good war diary for 1914 and when the 5th Dragoon Guards are in action with the entries are very detailed. Some months after 1915 only contain a short summary. There are a wide variety of appendices with the diary. There is a regimental history of the regiment which covers its First World War service: The Story of a Regiment of Horse, being the Regimental History from 1685 to 1922 of the 5th Princess Charlotte of Wales’ Dragoon Guards. Compiled by Major the Hon. Ralph Legge Pomeroy, some time a Member of the Corps. This book was published in two volumes in 1924 and hasn’t been reprinted since and is therefore difficult to obtain. There is a copy at the British Library. Private Papers of Captain John Norwood VC: 5-page transcription of extracts from his letters in August and September 1914: Documents.11228. Private Papers of Lieutenant George Ralph Miles: Miles served with the 4th (Royal Irish) Dragoon Guards 4th (Royal Irish) Dragoon Guards but was attached to the 5th Dragoon Guards. The museum holds a collection of his letters: Documents.14328. The extract from the 5th Dragoon Guards war diary below describes the Action at Néry on 1 September 1914. This small action was notable for the award of three Victoria Crosses to men of L Battery for keeping their one remaining gun firing under a heavy German barrage. This gun, known as the Néry Gun, is on display at the Imperial War Museum in London. 1 September 1914. Partridge shooting begins! A very thick misty morning. The ball opened with half-a-dozen shells bursting over the village. Immediately all was bustle. Everybody ran to the lines to saddle up, under shell and rifle fire. C Squadron was ordered to hold the houses facing E. A and B Squadrons were quickly collected, and galloped, under Colonel Ansell, to the North with the object of turning the German right flank. In the centre of the village the 11th held the outskirts facing East, while the Bays maintained their position at the South end, though they lost many officers and men wounded, and over 200 horses, by shell fire. Their lines were exposed to the fire of two batteries at a range of about 700 yards. L Battery, Royal Horse Artillery, suffered most heavily of all. All their officers and men who were in the battery were killed or wounded except Major Scalter-Booth, commanding, the Battery Sergeant-Major, and their French interpreter. Captain Bradbury, Royal Horse Artillery, had a leg shot off and continued doing his duty until his other leg was carried away by a shell, when his only request was that he might be carried to the rear, in order that his men might not hear him groaning. All the gun team horses were found shot an lying in their teams. Colonel Ansell’s move to a flank had the desired effect of making the Germans withdraw, but unfortunately he was killed in the doing of it. He had ridden to the crest of a bluff to view the situation, and was shot through the right breast. A corporal and two men carried him to shelter, where he died in a quarter of an hour. His last order to them was to get back to the firing line and leave him. Meanwhile, the German guns has been silenced by the fire of L Battery, and by that of the Bays’ machine guns, under Lieutenant Lamb, which came into action at the crossroads at the South end of the village, and made extraordinarily good practice. C Squadron, 5th Dragoon Guards, had gone to the South end of the village to support the Bays, who feared a flank attack round their right. A and B Squadrons reformed under Major Winwood commanding the Regiment, and returned to Nery, to find that the fight had ceased in that part, and that the Germans had retired, leaving eight guns on the field. The Regiment lost Lieutenant-Colonel G. K. Ansell, killed, and about 10 men; and 2nd-Lieutenant Maurice Hill, and about 20 men, wounded; together with from 60 to 80 horses killed or stampeded. It transpired that the Germans, who consisted of about a cavalry division with 10 or 12 guns, had blundered on to us in the fog. A wireless message was intercepted to the effect that this division had been unable to fulfil its mission, as it had been heavily attacked by the English. The only desire of the English at Nery at that moment was to get outside an excellent breakfast.